So for my fashion research and communication class, I need to start a blog, and since I already have one. I will just be making a post every week for it. Here goes my first post. For as long as I could remember jewelry has been my obsession. As of lately, I haven't really worn or purchased any new jewelry pieces. 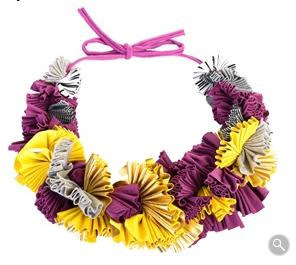 But the recent trends have been statement necklaces that .. well, make a statement. And I definitely think this is a great trend especially since you can just invest your money into some beautiful pieces that can be paired with a simple outfit. It's just really raw and different from most of the jewelry that I have seen. 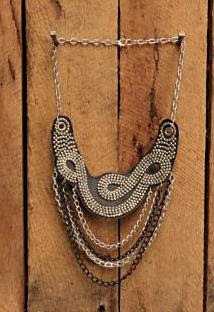 From fabric to metal fringe, this jewelry piece will not only give you rock star appeal, but amp up a simple look. The Bib, ain't just for babies. Not only do they have bling, but they also have some major sophistication. 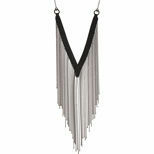 And even the bib can be edgy as seen in the second necklace with metal chain, leather and plated metal. 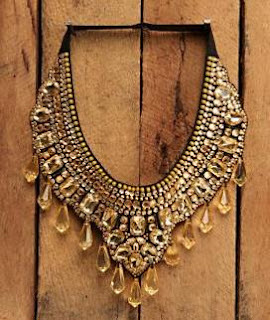 For the other necklaces, its all about the rhinestones, and crystals, giving it a classy and sophisticated look. 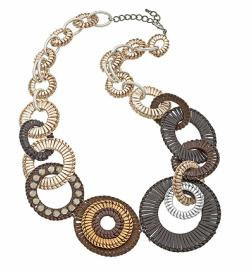 There are so many other types of statement necklaces. The last two are made from fabric and I really like how fabric can be transformed into jewelry. It seems to me a new trend that will only keep growing. Hopefully if I have time I will try to make some of my own statement necklaces.